My client is a dear friend who lives in the charming Vinings neighborhood of Atlanta and has graciously allowed me to design a few rooms in her home, including her beyond-fabulous basement, which we featured here a while back. 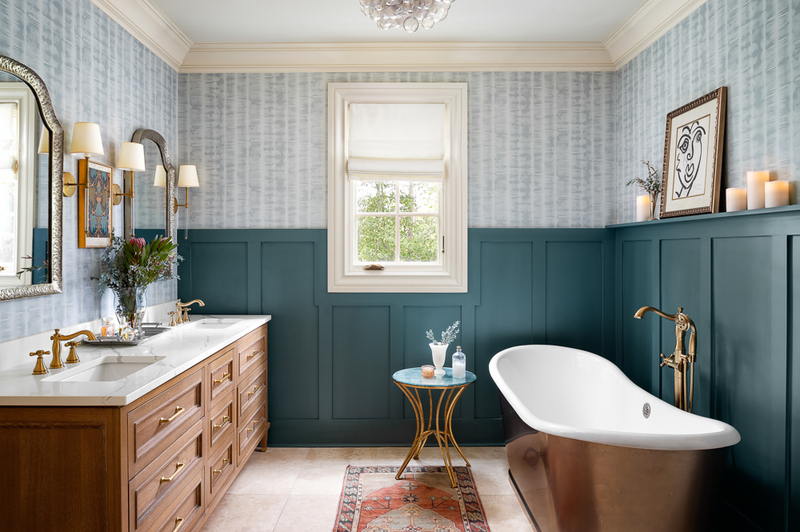 This time, she had a vision for her master bathroom that revolved around a glorious freestanding cast-iron tub with a stainless-steel skirt. First, we evaluated the existing room, which was spacious and included two large vanities that provided a ton of storage. She and her husband didn’t need all the cabinet space and knew they could function very well with one double-sink vanity, leaving the other side of the room open to house the new tub. These before pictures show what a large space we were working with, which was perfect for the show-stopping tub that would soon find its home here. We kept the windows, floors, and molding the same, but changed everything else. Since the wide skirt of the tub is coppery-gold, we planned to mix metals, incorporating both gold and silver tones throughout. We added a custom-made vanity designed to look like a dresser and topped it with quartz counters that complemented the existing floors. Then we hung ornate silver-edged mirrors above each sink and flanked them with clean-lined gold sconces. New wainscoting goes three-quarters of the way up the wall and is painted a rich blue-green shade that complements the pattern in the wallpaper above it. Adding glitz and glam to the space is this incredible bubble light fixture that’s reminiscent of bubble baths and all things gorgeous and delightful. And then there is the bathtub. Oh, magnificent, exquisitely designed, deep soaking bathtub. I mean, really, we could have done nothing else and this piece alone would have brought up the fabulous factor by about one billion. Set against the contrasting wall color, it shines like the fabulous diva it is. My client had this fantastic black-and-white figure art that we propped along the ledge of the wainscoting. Alongside it, we added candles for that quintessential spa feel, as well as a few sparkly accent pieces. A vintage rug completes the space in a timeless, elegant way.